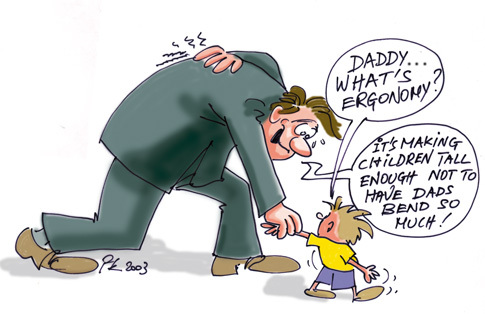 Ergonomics derives from two Greek words: ergon, meaning work, and nomoi, meaning natural laws, to create a word that means the science of work and a person’s relationship to that work. The International Ergonomics Association has adopted this technical definition: ergonomics (or human factors) is the scientific discipline concerned with the understanding of interactions among humans and other elements of a system, and the profession that applies theory, principles, data and methods to design in order to optimize human well-being and overall system performance. That is not the most efficient definition of what ergonomics is. Let us keep things simple. Ergonomics is the science of making things comfy. It also makes things efficient. And when you think about it, comfy just another way of making things efficient. However for simplicity, ergonomics makes things comfortable and efficient. It is used in design in many complex ways. However, what you, or the user, is most concerned with is, “How can I use the product or service, will it meet my needs, and will I like using it?” Ergonomics helps define how it is used, how it meets you needs, and most importantly if you like it. It makes things comfy and efficient. Comfort is much more than a soft handle. Comfort is one of the greatest aspects of a design’s effectiveness. Comfort in the human-machine interface and the mental aspects of the product or service is a primary ergonomic design concern. Comfort in the human-machine interface is usually noticed first. Physical comfort in how an item feels is pleasing to the user. If you do not like to touch it you won’t. If you do not touch it you will not operate it. If you do not operate it, then it is useless. The utility of an item is the only true measure of the quality of its design. The job of any designer is to find innovative ways to increase the utility of a product. Making an item intuitive and comfortable to use will ensure its success in the marketplace. Physical comfort while using an item increases its utility. The mental aspect of comfort in the human-machine interface is found in feedback. You have preconceived notions of certain things. A quality product should feel like it is made out of quality materials. If it is light weight and flimsy you will not feel that comfortable using it. The look, feel, use and durability of a product help you make a mental determination about a product or service. Basically it lets you evaluate the quality of the item and compare that to the cost. Better ergonomics mean better quality which means you will be more comfortable with the value of the item. Efficiency is quite simply making something easier to do. Efficiency comes in many forms however. Reducing the strength required makes a process more physically efficient. Reducing the number of steps in a task makes it quicker (i.e. efficient) to complete. Reducing the number of parts makes repairs more efficient. Reducing the amount of training needed, i.e. making it more intuitive, gives you a larger number of people who are qualified to perform the task. Imagine how in-efficient trash disposal would be if your teenage child wasn’t capable of taking out the garbage. What? They’re not? Have you tried an ergonomic trash bag? Efficiency can be found almost everywhere. If something is easier to do you are more likely to do it. If you do it more, then it is more useful. Again, utility is the only true measure of the quality of a design. And if you willingly do something more often you have a greater chance of liking it. If you like doing it you will be more comfortable doing it. 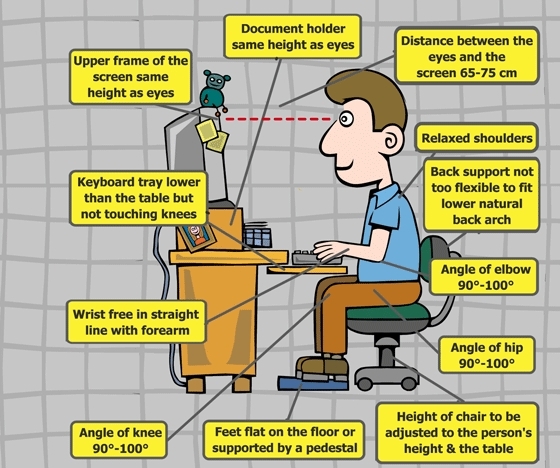 So the next time you hear the term ergonomics you will know what it means to you. And I hope that is a comforting thought. 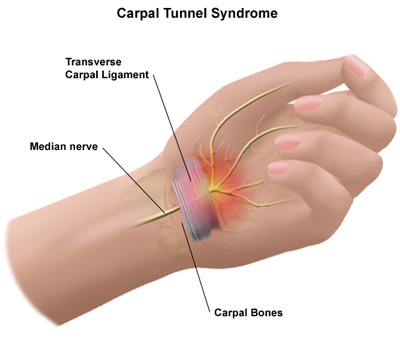 Computer Ergonomics and Repetitive Stress Injury Ergonomic Computer Setup How to Recognize Repetitive Stress Injury What Are The Types Of Repetitive Stress Injury?